If you help care for your aging parent, then you’ve probably heard the importance of taking preventative measures against pneumonia. That’s because Lansing seniors are much more prone to catching the illness. In fact, according to a 2009 study, the annual incidence of pneumonia among adults over 65 is four times that of younger populations. Read our FAQs to learn why and get tips to identify pneumonia symptoms and ensure a speedy recovery for your parent. Pneumonia is an infection (viral, bacterial, or fungal) of the lungs. Cases can range in severity. Milder cases sometimes get referred to as “walking” pneumonia because the infected Lansing senior person doesn’t have to stay in bed. More severe cases require bedrest. Why are older adults more susceptible to pneumonia? 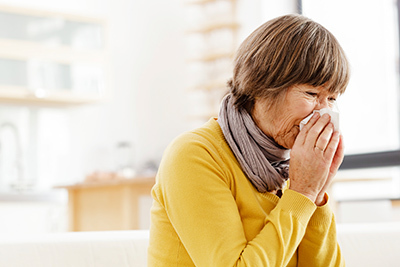 While symptoms like chills, shortness of breath, and chest pain will stand out to younger individuals, they may register as fairly typical among seniors, given their already weakened immune response. As a result, a Lansing senior may not even notice the signs of pneumonia, and thus may not seek help. As we age, our lung capacity shrinks. This makes it harder to cough up sputum, the mucus our lungs secrete in order to clear infections. By consequence, infections can fester among older adults and, worse, the mucus may accumulate in the bronchial tubes, preventing oxygen from entering the blood and cells of the body. Residing in an assisted living community or nursing home puts your parent at greater risk of contracting pneumonia due to the close proximity of potentially infected residents, visitors, and workers. This is known as community-acquired pneumonia (CAP). Older adults with dementia may not communicate that they’re not feeling well, thus allowing an infection to go unnoticed and worsen. Why is pneumonia a more serious condition for seniors? Lansing seniors are more likely to have other conditions, such as heart disease or COPD, that when combined with pneumonia can create dangerous complications and even death. Even a mild case of pneumonia can further weaken a senior’s already weak immune system, which can turn an underlying condition, such as heart disease, into a life-threatening malady. What are the signs of pneumonia in a senior? However, as noted above, symptoms may go unnoticed in a Lansing senior who might experience these conditions on a normal, healthy day. "The symptoms and signs are sometimes not as specific,” says Dr. Joseph Mylotte, a professor of medicine at the School of Medicine and Biomedical Sciences at the University of Buffalo, (via A Place for Mom). “They may be more sleepy and lethargic, or lose their appetites, or they may suffer from dizziness and fall." What does pneumonia treatment entail? Typical pneumonia treatment begins with a phlegm or blood sample to determine whether the individual has viral or bacterial pneumonia. Viral forms usually get treated with bedrest, while bacterial forms can improve with antibiotics. There are a few special considerations to make when prescribing an antibiotic to a senior. As we age, the ability to metabolize medications changes, and so older adults can become more sensitive to dosage and susceptible to upset stomach. Further, many seniors already take a cocktail of medicines, increasing the risk of potential negative interactions when adding any new medicine. Your parent’s doctor should take these factors into consideration, but it never hurts to do your own research on safe medication management. To help your Lansing senior parent feel more comfortable, you can give him or her over-the-counter medicines for fever and chills. Exercise caution with cough medicines, however, as coughing helps expel mucus to rid the lungs of the infection. You don’t want to suppress coughing entirely, but if it’s keeping your parent up at night, you can get a cough suppressant prescription. Are there any common pneumonia complications? Bacteremia occurs when the infection enters the bloodstream, where it can spread to other organs. A lung abscess is a fluid-containing cavity that develops in the lungs. Pleurisy develops when the pleura, or membrane that protects the lungs becomes inflamed and swollen. The fluid causing this inflammation can in turn become infected, a condition known as empyema. Acute Respiratory Distress Syndrome (ARDS) is a form of respiratory failure that may occur if the lungs become severely injured. If this happens, your doctor will administer a mechanical ventilator and supplemental oxygen. How can you prevent pneumonia? First and foremost, help your parent get the pneumococcal vaccine. Experts recommend getting the first dose of this vaccine between ages 50 and 60, and the second at age 65. The vaccine helps guard against 23 strains of bacterial pneumonia (many more exist). Seniors should also get an annual flu shot as pneumonia often strikes after an initial bout of the flu leaves the immune system compromised. Aside from vaccinations, help your parent exercise good self-care. This means thorough hand-washing, plenty of rest, good nutrition, and even proper dental care—pneumonia infections can occur around infected teeth. BrightStar Care of East Lansing, MI proudly provides Home Care and Support for Seniors, including 24 hour in home care, and support in independent and assisted living communities. We provide all levels of home care from companion services to Skilled Nursing. Medical Staffing, Home care, In-Home Skilled Nursing, In-Home Physical Therapy for pediatric, adult and geriatric patients, Companion and Personal Care for Elders with Alzheimer’s or Dementia. We also provide Home Child Care, Sitter and Nanny services for Children and Support for New Mothers. We Support Veterans and accept most Long Term Care Insurance benefits, provide Hospice care, Live-in care, CNA, Caregiver, RN, LPN, RN Supervision, Compassionate Care, and Compatibility Guarantees. We are an ALS Society partner, Alzheimer Association member, providing care for developmentally disabled and individuals of all ages with mental health and behavioral health diagnosis. Other services inlcude safe discharge and transportation from the hospital or rehab facility, Post Op care both short and long term, Pre Operation and preparation help and assistance, client monitoring for out of town family members. Proudly serving Bath, Dansville, East Lansing, Haslett, Laingsburg, Mason, Okemos, Perry, Saint Johns, Webberville, Williamston, Lansing, Stockbridge in MI. What Is Sepsis and How Can BrightStar Care Help?